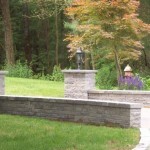 Retaining Walls MA, Decorative Walls MA, Retainer Wall Design MA, StairsDecorative Landscapes Inc. 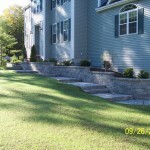 Decorative Landscapes Inc. installs both retaining walls and decorative type walls and stairs. 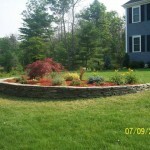 A retaining wall can turn an unusable portion of your yard into a functional recreational or operational area. By incorporating a stairway in the wall you can create an easily defined flow from one area to another. A decorative, non retaining, type wall can add architectural elements, depth and character to your property. Decorative Landscapes Inc. offers you Natural Stone, Concrete Segmental and Pressure Treated Timber Walls. With the company having the necessary heavy equipment for the job large BOULDER WALLS are also available. All these items bring their own beauty and feel to a landscape. Mixing both Natural Stone and Segmental Block can also create an aesthetically appealing look without all the cost of using all natural stone. Work with Kim or Dave to design your wall and decide which products will work best for you. As with any hardscape project the initial excavation and preparation work are the key to a successful long lasting wall. Another key element is proper drainage using stone and pipe behind the wall. If these key elements are not performed correctly your wall could sag or bow. Decorative Landscapes Inc. takes pride in always preparing and backfilling correctly to ensure the longevity of your wall. Based on the type of wall and materials that you choose Geogrid Textile Fabric may be required to maintain the integrity and strength of the wall. Kim or Dave will discuss this with you during your consultation. They WILL NOT compromise quality for price in this area because in the long run the wall would suffer the consequences! If you are looking for quality craftsmanship that will stand the test of time give Decorative Landscapes a call today to schedule your FREE Estimate or Design Consultation. Durability: Excellent. Good drainage and freeze-thaw resistance. Excellent. Lasts Forever! Excellent. Dense stones last indefinitely. Good dranage & freeze-thaw resistance. Poor. Stone resists freeze-thaw cycles but scattering of stones creates loss of structural integrity.